In order to provide highly skilled and competent individuals for the multi-million pound global kitchen industry, graduates will be exposed to a technically focused and knowledge based programme. enabling them to understanding client needs, be aware of design trends and have appropriate technical capacity. This course has been designed in conjunction with key members of the kitchen industry and is in response to national training needs. The key target population is for employees already working in the sector covering a wide number of job roles, while individuals with appropriate experience and transferable skills will also be welcomed. The course is offered as a blended learning opportunity, with three long weekend residential sessions each academic year where you will meet your fellow students, the course team and our industry supporters. We will expect you to relate knowledge gained through the course to your working environment, so that you both learn from and develop your existing roles. You will be expected to complete weekly learning tasks and contribute to the course as a whole. Kitchens are a multi-million pound global industry. To maximise your share of that industry you need a highly skilled and knowledgeable workforce able to understand client needs, design trends and technological developments. This three-year course is designed to enhance the skills and career prospects of those already engaged in the industry in a range of positions. It is delivered as a distance learning, work-related foundation degree. Three intensive residential skills workshops are included each year at our beautiful Missenden Abbey Conference Centre in the heart of the Chiltern Hills. Industry experts will share how they approach projects, develop imaginative designs and understand demands and constraints in kitchen design. You will be prepared to undertake further learning supported by tutors at a distance, using our online learning environment to maintain contact and submit short pieces of project work and gain comments and advice to improve it. Students should normally have five GCSEs including English at grade C/4 or above and an appropriate Level three qualification such as A' Levels, National Diploma, Access course, City & Guilds or equivalent. However relevant work experience from a related industry sector, an aptitude for design and a willingness to commit to the level of personal study required will be given equal consideration. Please contact us if you need any advice concerning your eligibility for the course. Our students are our best ambassadors and their voices here will provide you with a clear sense of their Bucks experience. I really enjoyed the course, and being exposed to the many different sides of design thinking. One lecture which really stood out was by Andreas Fabian, where he led an interpretation of design using the shapes and parts of spoons! I also enjoyed a project management scheme, which included a trip to the Roundhouse factory, following a kitchen from initial concept to the end installation. One of our most challenging projects was to design the kitchen area for a Maggie Centre in Dundee, designed by Frank Gehry; it was great to be using our skills in a real-life situation. I work for Kitchen Etc in Norfolk, a family business specialising in designing and installing bespoke handmade kitchens. This course is enabling me to achieve my final goal and my dream of becoming a professional specialist designer who can then take over the company fully and expand and evolve the company as I desire. I have learnt more in my first year than I could ever have imagined and my confidence has grown dramatically to the point where I am now starting to move into design and feeling comfortable about it. On successful completion of the programme, you will be able to recognise the conceptual and theoretical issues that underpin the practices of kitchen design. You will be able to identify the emerging developments and trends within the kitchen industry and the way in which these have developed. You will also understand the ethical and sustainability issues affecting the design and production of kitchens. In addition, you will be able to generate concepts and ideas in response to set briefs as well as select and evaluate the effectiveness of appropriate materials, processes and environments used in the design and production of kitchens. 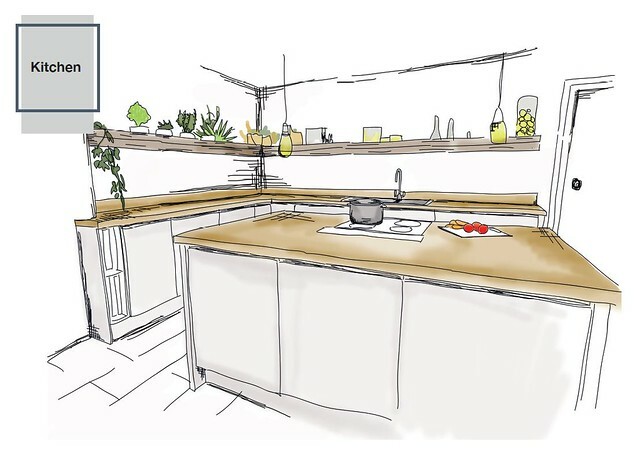 You will be able to present solutions to design problems in set briefs and self-initiated work, demonstrating creative thinking and approaches to problem-solving in kitchen design. This course will also help you design and develop kitchens from concept to outcome for a range of consumers and market levels, produce a variety of 2D and 3D visual images and designs in both virtual and physical formats for professional and commercial audience. You will also be able to plan and manage kitchen projects to a professional standard and in adherence to industry and planning standards. See here all our industry partners.